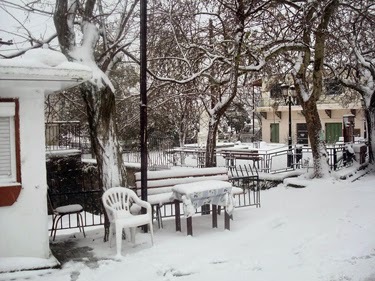 The New Year presented Lesvos with a thick layer of snow; especially in the higher regions and the mountains where it was plentiful. It got Agiasos renamed Small Switzerland: even without snow this little mountain village is picturesque, but with a layer of snow it is like an Alpine paradise and photographers can’t get enough of it. I also saw pictures of Anemotia in the snow, nearly as beautiful as Agiasos. The first winter I spent on Lesvos was also pretty cold and had mainly lots of sleet. As soon as the snow whirled down, all the villagers came out to see the spectacle: snow in Molyvos is very rare they said. However the next winter, in 2004, was even worse: you couldn’t count the snow falls anymore and Molyvos coloured white more than once. I then concluded that Greeks must have bad longterm memory, because they pretended the snow was very special, but I had then seen snow two winters running. There was so much snow that even Eftalou and her beaches were white and of course nobody claimed to ever have seen that before. I must admit that since then winters have become a lot milder. Since then I have not seen snow in Eftalou. Even though the highest peaks of the island, Mt Lepetymnos and Mt Olympus have, now and then, gathered some snow, last winter they remained green. And whilst Agiasos once or twice has turned into a Christmas postcard, it was never for long, nor as beautiful as this year. It is clear that you cannot trust Greek winters. On any one date temperatures can vary immensely. Take for example New Years Day. In 2010 temperatures reached 23 ºC and in 2007 they went down to minus 7ºC. Last New Years Day the thermometer barely reached 3 ºC and last few days it has descended slowly to below 0, so that in many places - even at the seaside – there were frozen water flacks and many broken water pipes. Low temperatures do not have to be a problem. What’s really unbearable is the windchill. At the beginning of this year a wind from the north turned into a nasty storm and made being outside nearly impossible. And this Voreas keeps on blowing his icecold Siberian breath over the island: what a chill! Personally the new cold year surprised me with a nasty flu and so I did not enjoy all the beautiful sights with the snow nor did I go for a walk in the snow. Buried deep into a warm bed yesterday my thoughts were in the harbour of Molyvos (and all over Greece), where Epiphany was celebrated. The priests, while most of the villagers were present, blessed the sea. During these kind of celebrations everyone dresses up and from deep under my pile of blankets I could feel them shivering in the almighty cold. The low temperatures, feeling even lower due to the wind, did not prevent a group of boys from standing ready in bathing suits to dive into the water, looking for the cross which the priest throws into the sea. Not even a mighty Ice Queen can halt this tradition. Armed with a hot water bottle at the feet and hundreds of Kleenex around my head I have lots of time to muse about this New Year. Just like the weather reports that cannot get rid of the cold, the political barometer also tends to storm. The news of the attack at Charlie Hebdo (the French satirical magazine that I used to read when living in France, but for years now lost sight of) hit my bed like a heavy earthquake. I was wondering if this magazine would have already prepared for next month a special issue about Grexit, a Greece without the euro or Europe without Greece. So I slumbered away into a world where the drachma would re-appear. I dreamt about a procession of strangely dressed people, straight out of a Jeroen Bosch painting, who swarmed through the narrow and snowy streets of Agiasos. In each street more people gathered. They merrily waved with big piles of drachmas and started to make a fool of the Greek Gods. Their behaviour became more and more obscene and their screaming louder until the village and the snow disappeared because of the huge congregation of people and everything became a pretty straggly gruel. In a few weeks the Carnival will start and for the Greeks this means the opportunity to satirize everything they do not like in life: the Greek carnival are The days of Satire, because on those days nothing will be spared, even the Holy Church. Beautiful Agiasos is especially known for its incisive political satire. And I am sure there will be lots of laughter this year during carnival, because the worse life is in a country, the better the satire. And no Kalashnikov nor any other violence will prevent the Greeks from this great carnavalesque criticism.